The best advice I ever got, I got before I was six years old. Do you still remember the nightmares you had as a child? I don’t know if it’s neuroscience-y brain-formation stuff or invisible spiritual stuff or some combo of both, but it’s curious to me that some of my most vivid and haunting dreams happened when my experience of the world and reality had been so small. I’d say “I don’t remember.” When I did remember. But I lied, not because I didn’t know how to communicate about the neighbor’s dog getting its head ripped off or a hoard of ham-sized spiders coming up from the storm drain in front of our house or the demon-monster under my baby sister’s crib. I lied because I was afraid that—even though I don’t remember this ever being the case—if I said the things out loud they would sound silly. That what was terrifying and upsetting to me would be dismissed by the people whose opinions I valued. So “I don’t remember” seemed easiest and safest, and anyway it was much too dark to comfortably talk about scary things. In other words, I took away my parents’ ability to comfort and reassure me. And really, waking the parents up for a dream you can’t even remember seems sillier than being freaked out by a bloody, headless dog. So I was working against my own ends there. My parents would look at each other and eventually say to me, with gentleness and also tiredness, “Well. Try to go back to sleep.” Which wasn’t very satisfying to me, but I didn’t have a good argument. I’d already told them I didn’t remember why I was scared. They were only working with the information they had. Those. Words. Stuck. Even in my limited understanding, it was a game changer. Think about Jesus. But Jesus was Sunday school songs and waiting to eat dinner and church puppets and flannelgrams, and you’re telling me, Papa Rhea, that thinking about that Jesus could have any effect on whether I refuse to let my eyes drift to the dark corners of my bedroom ceiling? But you know what? My papa was right. I began to think about Jesus. Not as an intellectual exercise. Not as a counting-sheep soporific. I began to think about who He is. Even now, my natural tendency is to pin all the wrong things to the top of my brainfeed. To go first to the anger, first to the trauma, first to the resentment, first to the fear, first to the ugly. But that is not the way I learned Christ! When I am dwelling in the goodness of who Jesus is, what He has done, what He continues to do, what He will do, it doesn’t make me ignore those other things. It doesn’t make me fall asleep to them or pretend they don’t exist. It allows the Holy Spirit to place all those things in a right perspective. It ensures that, by His strength, I won’t be defeated by them. What does my anger look like when it’s first channeled through His righteousness and compassion? How does my response to trauma change when my mind is set on an eternity with my Lord? How does my resentment appear next to the beauty of His forgiveness? What fear could I have that would dare even to tilt its head back and look up at Him? And the more I think about who Jesus is, who I know Him to be, the faster I come to realize I can communicate with Him about the things that are upsetting and frightening to me. The safer I feel in letting Him into the parts of my soul my instincts tell me to hide. The freer I am to accept His comfort and love and discipline. The deeper my relationship with Him becomes. And the more I want to know Him. The best advice I ever got, I share with you now, wherever you are. Think about Jesus. About the author: Kaley Rhea is a St. Louis-area author and one half of the mother/daughter writing team behind 2017 Christian romantic comedy Turtles in the Road (along with the hilarious Rhonda Rhea). 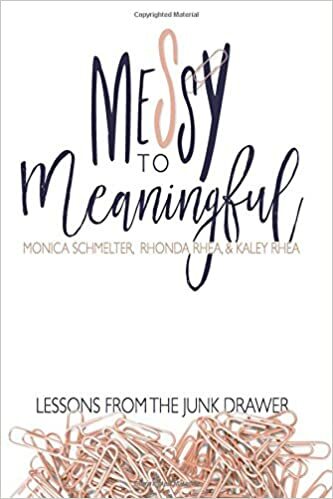 She also makes up one third of the writing team for the just-released non-fiction book Messy to Meaningful: Lessons From the Junk Drawer (co-written with Rhonda Rhea and the fabulous Monica Schmelter). She’s unclear on how fractions work, but if Rhonda Rhea is the common denominator, Kaley is pretty sure that makes her like five-sixths of Monica Schmelter. Or something like that. Join the conversation: What thoughts about Jesus are most meaningful to you? Love this Kaley! Thank you for the beautiful reminder to guard my thoughts and think about the One who is true, right, lovely, excellent, and praiseworthy! Wow, Kaley. Just wow. Love this. So much wisdom in a child’s perspective. I love the a-ha moment of six-year-old you. Thank you so much for sharing this!